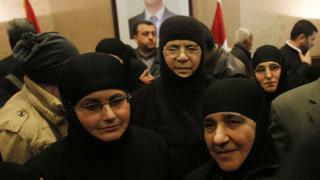 Months of tough negotiations led to the release of a group of Greek Orthodox nuns, held for three months by Syrian rebels, the man behind the deal tells the BBC's Rami Ruhayem in Damascus. Just before two in the morning on Monday, a group of nuns who had been abducted by Syrian rebels arrived at Jdeidet Yaboos on the Syrian side of the main border crossing between Syria and Lebanon. Almost simultaneously, a group of Syrian men and women who had been imprisoned by the Syrian government also made an appearance before a crowd of journalists. The first prisoner exchange between the al-Nusra Front, the al-Qaeda affiliate in Syria, and the Syrian government had finally been completed. Overseeing it was General Abbas Ibrahim, the director of Lebanon's General Security Branch who played a key role in mediating the deal. "For four months we've been working quietly and with determination to complete this deal," he said. "The situation on the ground in Yabroud changed, and there was a push to complete the deal. We intervened at the right time. The negotiations were tough but it's all about seizing the opportunity." The nuns had been taken from Maaloula to Yabroud, a stronghold of the al-Nusra Front in the mountainous Qalamoun area along the Syrian-Lebanese border. The city has been under attack by Syrian government forces and Lebanese Hezbollah militants for weeks. There was no safe route between Yabroud and Damascus, and the nuns had to take another route into Lebanon, and back to Syria through another crossing. General Ibrahim said that Qatari intelligence also played a significant role in the mediation. The release of the nuns took several hours more than expected and at one point, the deal appeared on the verge of collapse. General Ibrahim said the kidnappers tried to secure a better deal at the last minute, which led to the delay. As the nuns walked into the reception room at the border point, large jeeps painted with the colours of the Syrian flag and pictures of the Syrian President Bashar al-Assad roamed the streets, playing loud music about Christian-Muslim coexistence and brotherhood. It was meant to show the contrast between the Syrian government, which portrays itself as secular, liberal, and tolerant, and the rebels, which it portrays as religious fanatics. But inside, the nuns were telling the press a different story. "As God is my witness, I tell you the al-Nusra Front treated us well," said one of them. One journalist asked how she could say that when the militants forced the nuns to take off their crosses. "They never forced us," she replied. Meanwhile, another war of narratives was taking place. The Islamic State in Iraq and the Levant (ISIS), another group formerly associated with al-Qaeda, has been fighting the al-Nusra Front in many areas of Syria. They say al-Nusra sided against them and allied itself to secular rebels who fought ISIS fighters and attacked their wives. "The al-Nusra Front is merciful when it comes to Christians, ruthless when it comes to the wives of foreign fighters imprisoned by its allies," tweeted one ISIS supporter. Unfazed, al-Nusra supporters shot back. "This is the true religion of Islam," tweeted one of them. "You've given the world a lesson in morality, God bless the Mujahidin." As General Ibrahim prepared to leave, I asked him whether the negotiation channels established through the talks could pave the way for mediation that goes beyond prisoner exchanges. "I am ready for any role consistent with my mandate under Lebanese law, and in conformity with Lebanese government policy," he replied. "I believe conditions are favourable."